Electronic Arts on Thursday announced that its latest game „Apex Legends“ hit 10 million gamers in three days. Rival Fortnite’s viewership on the streaming site Twitch was „basically chopped in half“ following EA’s release, said Jefferies in a note seen by Bloomberg. Within three days of its Feb. 4 debut, the number of gamers playing „Apex Legends“ had crossed 10 million and there were about 1 million people logged on at the same time, EA said in a press release on Thursday. The announcement sent shares up 16% on Friday. Like its rival „Fortnite,“ EA’s game provides a battle royale experience in which multiple players fight for survival at the same time. 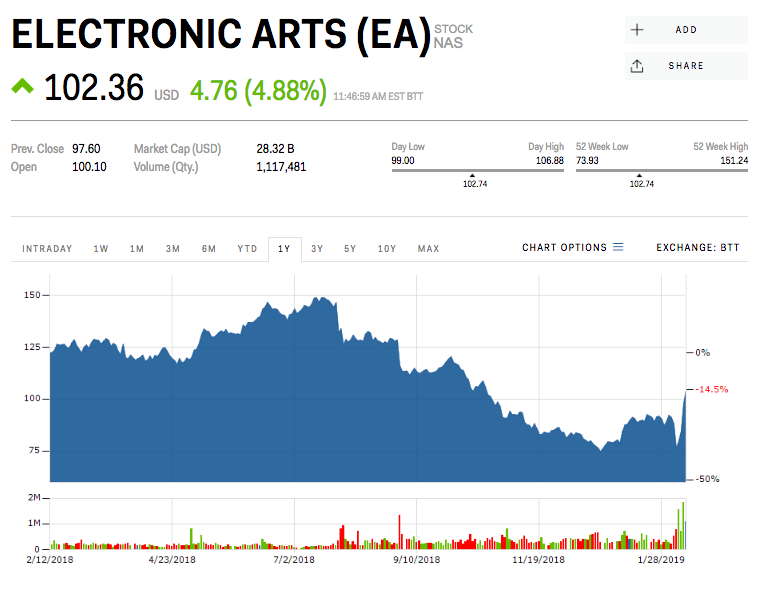 The figures of EA’s latest game come just days after the company lowered its annual revenue guidance to about $4.75 billion from $5.20 billion following weak sales of its „Battlefield V“ title amid a competitive gaming market.